People just know me too well. My cousin (the Pampered Chef rep, if anyone needs anything) sent me an email filled with pumpkin recipes. This one quickly caught my eye. 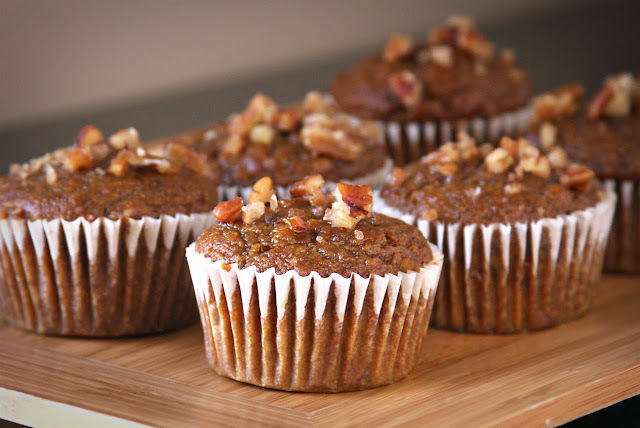 I had been wanting to make pumpkin muffins, but I wanted a recipe with a twist. I don’t think I’ve ever seen any with a molasses glaze. These muffins exceeded my expectations. They have a warm, delicious, down-home taste. Instead of molasses I used some locally produced sorghum I had on hand. 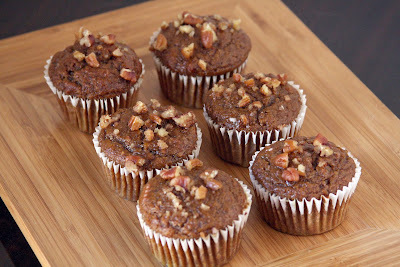 (The difference between sorghum and molasses can be found here) The glaze really helps to keep the muffins super moist. The pumpkin flavor is definitely there, but not overwhelming. The Boy really enjoyed these muffins, and we all know his opinion on pumpkin treats! Preheat oven to 350 degrees. In medium bowl, sift together flour, baking soda, pumpkin pie spice and salt. In large bowl, beat together sugar and oil (or applesauce if you prefer). Beat in eggs, one at a time. Add pumpkin, molasses and buttermilk then beat until blended. Stir in flour mixture and nuts just until blended. Grease, or line with paper cups, 12 count cupcake pan. Divide batter evenly among cups. Bake at 350 degrees for 25 to 30 minutes, until golden brown. Cool in pan 5 minutes, and then remove to rack. In small bowl, whisk together glaze ingredients, except nuts, using enough water to make thick glaze. Dip muffin tops into glaze and transfer to rack. Sprinkle with nuts. Those muffins look amazing. I've never heard of using a molasses glaze.